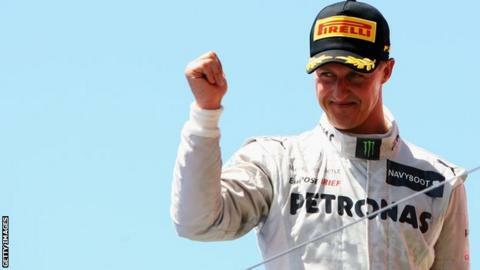 Seven-time Formula 1 world champion Michael Schumacher is "fighting for his life" after a ski accident in the French Alps. Doctors say the German, 44, is in a critical condition in hospital in Grenoble with head injuries suffered on Sunday morning at the resort of Meribel. Personalities from Formula 1 and the world of sport have rallied around the former Jordan, Benetton, Ferrari and Mercedes driver. Former F1 driver and BBC F1 co-commentator David Coulthard told BBC Radio 5 live: "I know Michael from the race track, and there's no question in my mind that he has the physical ability to take on this challenge, which is the greatest one of his life. "Michael sits there as the most successful driver in Formula 1, so if anyone knows how to muster inner strength and determination then there's no doubt in my mind Michael Schumacher is the man to do it." Ferrari engineer Rob Smedley told BBC Radio 5 live: "What Michael represented in Formula 1 was the fight, the spirit and the absolute determination to win. Second was never good enough. "He pushed everyone else along, and that's what's giving me a lot of hope right now. He's lying in a hospital bed in Grenoble and he needs that fighting spirit to pull through." Martin Brundle, Schumacher's former Benetton team-mate, tweeted: "Come on Michael, give us one of those race stints at pure qualifying pace to win through, like you used to. You can do it." BBC F1 chief analyst Eddie Jordan, who gave Schumacher his Formula 1 debut drive in 1991, told BBC Radio 5 live: "If you were going to look for someone to take on the fight, whether it be sporting or in life, Michael is someone you would want on your team. "He's resilient, he's a very tough guy, so much so that people didn't always warm to him, but that was his persona and he brought a new level of professionalism to Formula 1, certainly in terms of fitness." McLaren's Jenson Button, the 2009 world champion, tweeted: "My thoughts are with Michael Schumacher at this tough time. Michael more than anyone has the strength to pull through this." Double world champion Fernando Alonso tweeted: "Get well soon Michael! Hope to hear some positive news very soon!" Former Ferrari driver Gerhard Berger, who worked with Schumacher on improving safety in Formula 1, told BBC Radio 5 live: "Michael was very committed to safety. Safety for him is a big issue. "What has happened is poor destiny. He had been on a family ski day, he had all the safety equipment but still things like this can happen. It's very sad and I pray that he survives. "Michael has a lot of physical strength, he knows how to handle accidents and he knows how to fight with his body." Legendary commentator Murray Walker told BBC News: "Michael is tremendously determined. He fought his way to the top of his profession, from a humble background, and significantly, he is a fighter. "When he retired from Formula 1 for the first time, he took up motorcycling and hurt himself but he fought back from that. I hope he fights back from this just as well." Schumacher's former team Ferrari, with whom he won five of his seven world titles, said in a statement: "Everyone at Ferrari has been in a state of anxiety since hearing about Michael Schumacher's accident. "President Luca Di Montezemolo, through team principal Stefano Domenicali, is in constant contact with the family and those close to the German champion. "Montezemolo has offered his encouragement and support at this very difficult time, with the hope that better news will come soon." Former Alpine skiing world champion Luc Alphand: "I'm stunned. Skiing, for me and a lot of people, is a leisure before anything else. He might have hit a rock with his feet and you don't need to go fast to hurt yourself." Former England cricket captain Michael Vaughantweeted: "Forget the Cricket. Everyone's thoughts should be with Michael Schumacher."